Harvesting: If you’re growing tomatoes, peppers, or onions in your garden, it’s time to harvest! Enjoy your bounty by preparing homemade salsa for end-of-summer parties. Structure: Whenever you’re watering or just taking a stroll around your garden, double-check any structures that are supporting your plants. Stakes, supports, and trellises can shift or deteriorate so keep an eye out for structures that may need to be moved or fixed. Roses: Give roses the tough love treatment and stop feeding them in August. This way, they will strengthen to the point where they are more capable of surviving the eventual cold winter frost. Depriving them now will prevent roses from dying later. Pruning: Once August rolls around, you don’t need to keep pruning spring-blooming shrubs and trees. The same goes for summer-flowering shrubs and evergreens. Pruning removes new buds that are forming, which you’ll want to see next year. With evergreens, pruning encourages new growth which, at this point, unfortunately won’t have a chance to strengthen sufficiently enough to withstand winter temperatures. Dormant plants: Save some colorful golf tees for later when you go out to the course. Situating tees on top of your dormant plants is an especially useful way to keep track of where your spring bulbs and perennials are located. Cuttings: If you like to use cuttings from your garden to grow new plants, there are several varieties to concentrate on this month. In August, collect stem cuttings from herbaceous and half-hardy perennials. Gather softwood and semi-hardwood cuttings from shrubs and climbers, Alpines, and Strawberry runners. August flowers: Having trouble keeping flowers alive in the sweltering heat? There are several varieties that actually thrive in August. If you’d like to see more plant life in your garden right now, consider Black-eyed Susan, Russian Sage, Yarrow, and Threadleaf Tickseed. Clean up: Keeping your garden tidy doesn’t just make it look more attractive, it prevents disease and pest infestation. Rid your lawn entirely of seeding weeds and rotting produce. 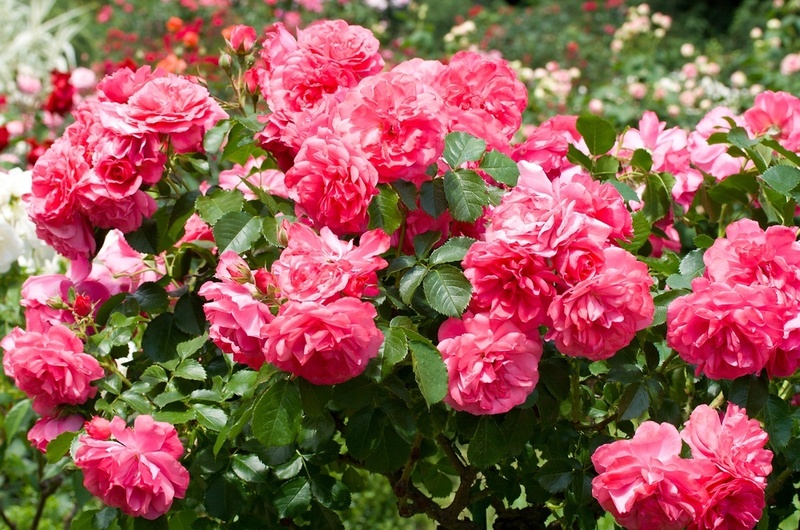 Fallen rose and peony leaves should also be picked up because they tend to harbor disease and pests during the winter. Vacation: Sweltering August is a great time to go on vacation! Make sure that your garden is taken care of while you’re gone by reaching out to a neighbor, friend, or family member who might be willing to drop by and water your plants. A hose equipped with a water timer and sprinklers can also be set up to address your yard’s summer needs. Think through these possibilities so your mind is at ease while you’re on vacation. Lawn: Once temperatures start to drop, there will be several steps you can take to revitalize your lawn after a hot summer. Look into core aeration, especially if your yard attracts foot traffic or consists of clay soil. Interested in re-seeding your lawn or growing new grass? By the end of the month, you can begin working towards your goal. For best results, till or rake your lawn, apply seeds, and water lightly several times per week. Fall plants: Autumn is thankfully on the horizon. Start considering what you might want to see in your yard and containers come fall. Browse appropriate blooming plants like mums and asters. Take home your favorites! Evergreens: Get your mind off of the stifling heat by planning ahead for winter. By the end of the month, you can start planting evergreen trees and shrubs. Giving them several months to establish themselves before the cold hits strengthens evergreens.